Used with 13-A drop target. Short bolt approx 3/4-inch with groove for e-clip, as used for drop target mounting in older Stern solid-state games from approx. 1977 - 1985. Fits through drop target and connecting arm and secures with 1/4-inch e-clip. 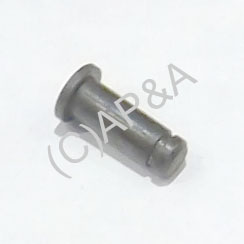 Can also be used to replace Bally part # S-458-27 used with Bally drop target # A-3944.